Jay and Madeleine Crowdus, a husband and wife artist team, started their venture called Elegant Garden Design in 2011. Jay being a graphic artist, was always inclined towards creating products that capture imagination combined with Madeleine’s experience in fine arts. They both started their design startup with hand-crafted rustic metallic birds silhouettes that can ornament garden and homes. 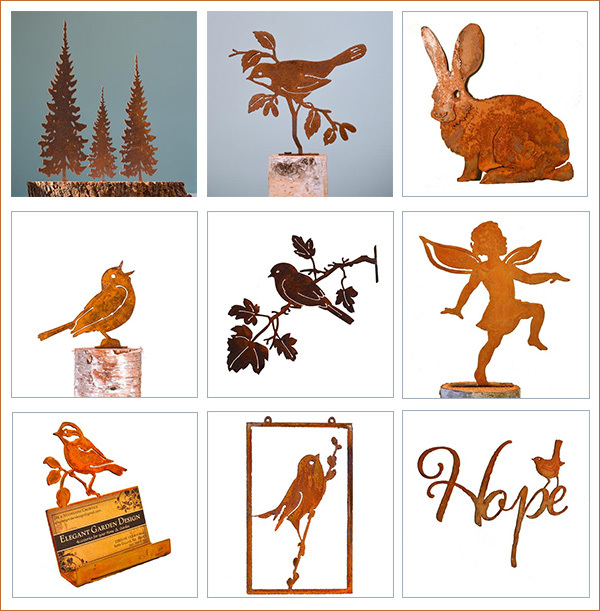 “We wanted to turn our love for birds and other garden and woodland inhabitants into delightful, engaging, rustic metal silhouettes that would beautifully enhance gardens and homes. This led us to start our own venture, Rusty Birds. Along the side, Jay and Madeleine wanted to offer a dedicated line of products to wholesalers, which can not only be a great way to re-engage with the wholesalers whom they have lost touch with, but offering their range of products at a competitive price can also give a great boost to sales. On the top of that, they wanted to offer a hassle-free buying process for the wholesalers, where they can create their account with Elegant Garden Design website and can back order/bulk purchase in just a few simple clicks. “Shopify provided us the easiest way to connect with business owners and customers. Our wholesale website was designed keeping in mind an easy search option & quick display of product category. And our retail website, Rusty Birds, is designed to boost better engagement with customers. While dealing with end consumers and wholesalers, Jay and Madeleine realized that today’s consumers are more demanding than ever. While they interact with online retailers, they need to have a seamless shopping experience, and the luxury to shop and receive their order on time is essential. The biggest challenge was to sync all the sales orders across the channels. Managing all the Marketplaces and Shopify store products and orders. Updating marketplaces & Shopify stores with real-time shipping/tracking information. Updating the marketplace & Shopify stores with real-time inventory update. Tracking the order fulfillment process. “We were even thrived with shipment incontinence. We ship using USPS flat rate boxes, our customer also includes wholesalers where the parcel size and weight is usually large. We want to provide the most economical shipping options to our customers. However, calculating the most cost effective shipping mode for each orders was indeed a tiresome process. Enterprise, our warehouses are located at multiple locations, so we have to optimally manage inventory operations across the fulfillment process. 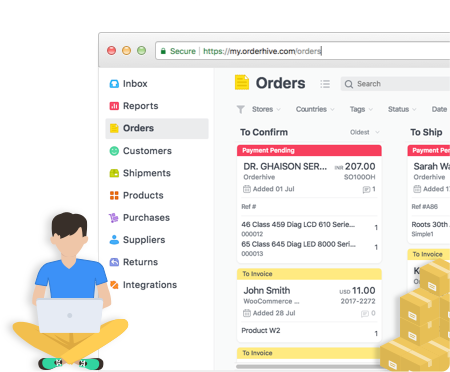 “Orderhive Enterprise Solution is the only software that not only got integrated with my sales channels but even centralized my multi-channel & multi-warehouse operations – everything from order management, inventory management to fulfillment can be handled from a single backend. 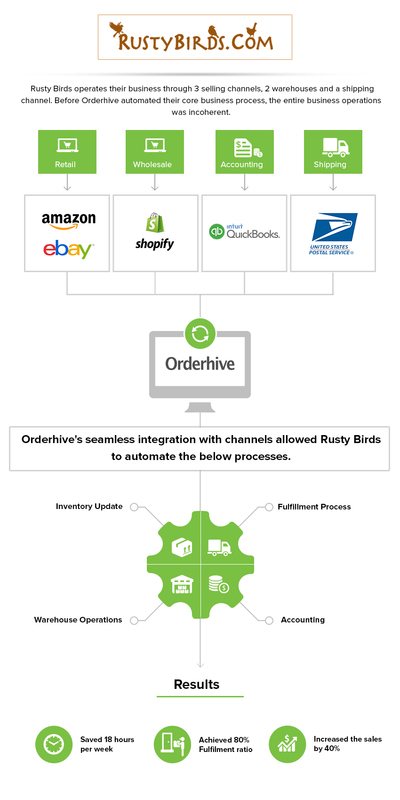 “Orderhive enabled us to consolidate data across the channels and sync it in a single backend. We can easily accommodate with the scaling demand, the Orderhive system constantly sync the incoming orders and allows us to process it in few clicks. It also enable us to locate the product in a warehouse through which we can manage to ship the orders in the most optimal way. Orderhive has added another level of sophistication to our wholesale distribution operations. Their warehouse management features are designed to enable wholesale distributors to adapt to changing customer expectations. We can anytime check the availability of a particular product across the warehouse location and optimize the shipment cost by fulfilling the order from the nearest location. Orderhive integration with QuickBooks, helped Jay and Madeleine to process their business and speed up data flow. Remove the needless process of manually entering the invoice & payment details. Ensure accurate and timely retrieval of data on the basis of key information. Before Orderhive, Jay and Madeleine used to manually map the billing details of each customer in order to retrieve the company details from the database. However, after customizing the process. The system automatically maps the billing data and reflect it in the system, avoiding the tedious task of manually mapping each invoice entry. Why we manage our multi-channel business on Orderhive? We operate at 100% of our efficiency. We focus more on customer service & product designs instead of managing backend operations. We can plan our production in advance, cut down on our logistic cost and fulfill orders faster than ever.